Alter Ego began as an acoustic duo with Matt Hurt and Mike Thompson. Knowing they wanted a full band, they seeked members with chemistry and talent to build a great foundation of music. This was complete upon the arrival of Todd Roseberry on drums and Jimmy Slaymon on bass guitar. Alter Ego has proved that hard work pays off with a growing fan base and radio airplay. Find yourself lured in with catchy vocal hooks and radio friendly rock that is sure to intrigue. 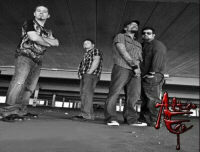 Alter Ego is a solidly growing band with a drive for success.